Where was the location of this photo? Provide a rationale. The photo was taken south of Transverse Road between Pell Terrace and Russell Road in Garden City. Based on the location of the utility line on the right, the photographer was looking north. 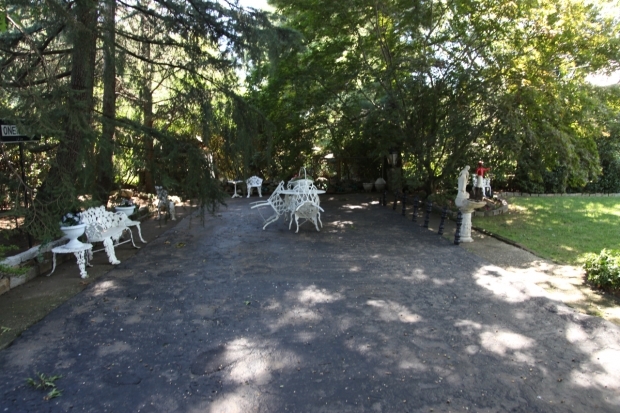 Rationale: The previous images of Arthur Jasper's backyard in Garden City. What is your best guess of the original date of this photo? October 15, 1958. 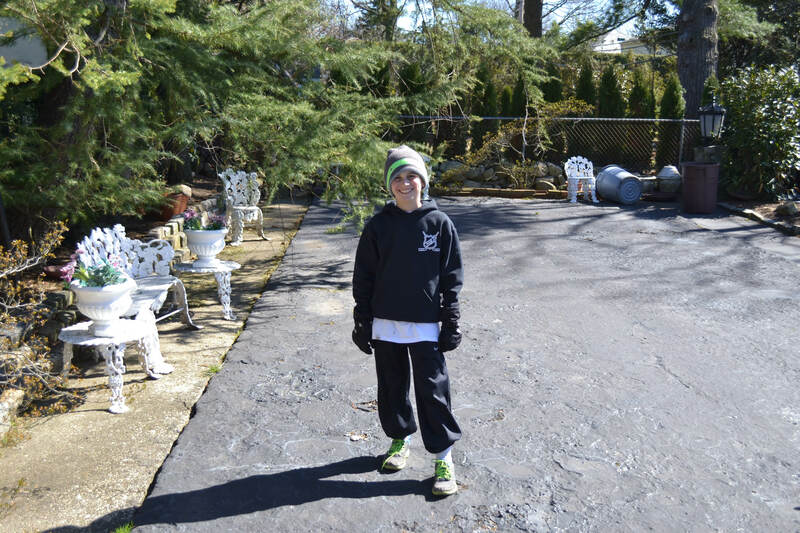 Rationale: The level of growth surrounding the Motor Parkway and the boy's clothing and sneakers. Congrats to Joe Osterle, Greg O., Sam Berliner III and Frank Mendyk for correctly identifying Garden City as one of the locations for the Mystery Foto. Kudos to Greg O. and Frank Mendyk (see amazing "Today" images below) for correctly identifying the 1958 date. 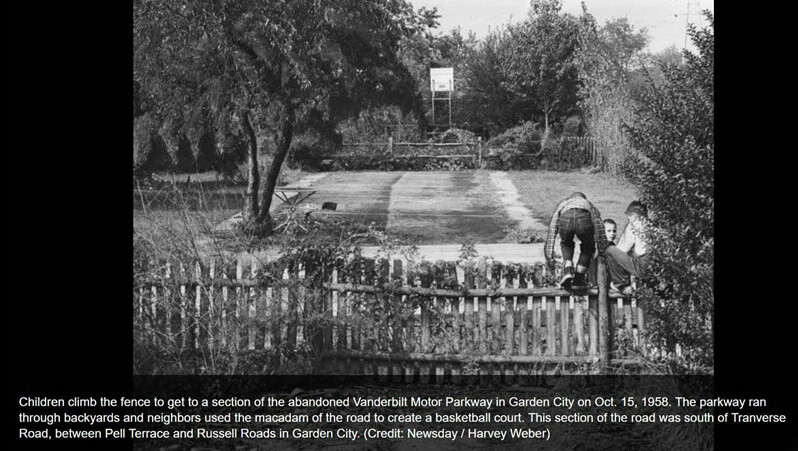 Photo taken on October 15, 1958.on a section of the Motor Parkway "south of Transverse Road between Pell Terrace and Russell Road" in Garden City. This 1950 aerial shows the Mystery Foto section of the Motor Parkway in Garden City looking south from the future Transverse Road towards Clinton Road. The Russell Road houses can be seen to the west of the Motor Parkway. Foundations for the Pell Terrace homes were just being built. Sammy on Arthur Jasper's section of the Motor Parkway. Note: The 3-foot concrete extensions. With permission of the home owners, Frank Mendyk took these photos of the Mystery Foto. The view is looking to north with the utility tower line hidden behind the trees on the right. The owner of the adjacent property stated "they removed parkway a few years ago and planted grass. They said it was a real involved process in which they stated the concrete was 18" thick." View looking north with utility tower line on the right.The owner of this property stated "the previous owner paved over the parkway and made a patio and ice rink in the winter." Photo looks in the 1950’s. I am going off the way the kids are dressed. As for location….. The Albertson/Williston Park border in the back yards of Schley Ave or William St…. or maybe from Hillside to Jericho in Mineola…. or perhaps Garden City. All of these answers are based on way the road looks to be going through back yards. In Manhasset Hills there are were not fences over the road. I will be awaiting the answer. I’ll guess this is in Garden City where residents along Pell Terrace and Russell Rd. could opt to extend their property into the Motor Parkway roadway. Judging by the foliage, the trees growing through the parkway and the boy’s clothes, this looks to be 1958. Forecast for Sat is rain. Good time to tackle this one at the local library. Nice image, Art. My guess is Skinner lane near Orchid road in Levittown! I think I see high electric towers on the right top corner in photo that may be the towers that cut across Newbridge road near an electric station on the west side of Newbridge! The kids look like typical Levittown kids that grew up there in the late forties early fifties! The kid climbing looks like he has either Keds or Converse sneakers on! 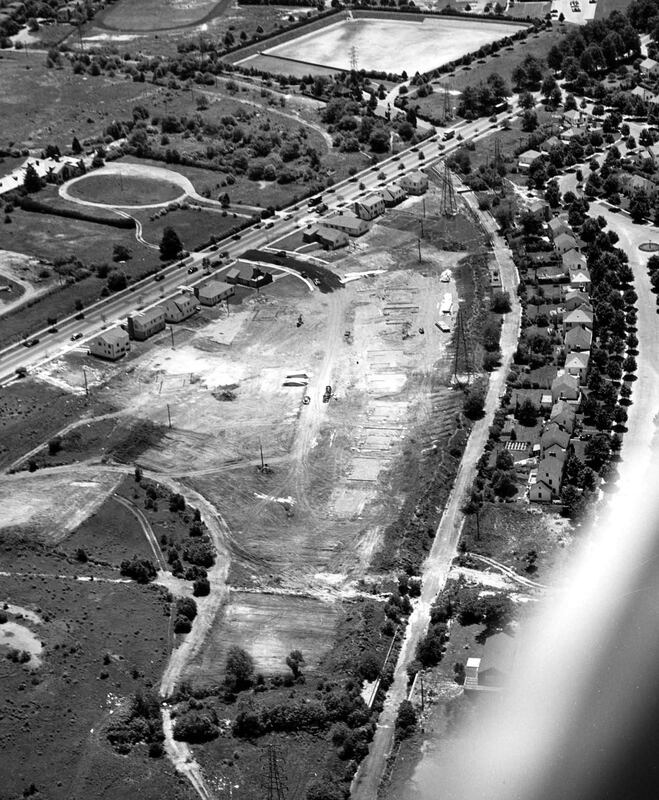 I’m guessing Levittown, near where the grandstand stood. Looks like a section that’s closed off with a chain link fence now. I’m just going to take a wild guess on the location for this one: between Jericho Turnpike and Westbury Avenue in Carle Place. Judging by the short hair cuts and black hi-top sneakers on the boys, I’ll guess around 1958 for the date. The quality of the photo is poor due to the reprinting. You can observe in the upper right hand corner a electrical high tension tower. There are a few locations along the parkway that matches up to the photo. Due to the location of the tower, the gentle curve of the parkway, and other characteristics I determined that this section of remnants is in Garden City. The location of the photo is in the rear yards of the houses on Russell Rd. This would be between Russell Rd and Pell Terrace near Kenwood Rd. I later went and read the article from Newsday. The time of the photo would be slightly before the Newsday printing of the article on 10/24/58. I spent a GOOD amount of time at the Sachem Public Library searching the NEWSDAY ARCHIVES ( 1950 thru 1970 -“Standalone Images” ), but no luck. Really wanted to solve this one. However you came across this image, Art; it’s an excellent photo. Maybe I was distracted by the pretty lady librarians, lol. How come I didn’t notice that tower to the upper right? Ugh! If I noticed that from the start, I wouldn’t have needed to RESEARCH it so DEEPLY. A visit to the library is never a waste of time, besides. Howard, what a great aerial photo of the section. 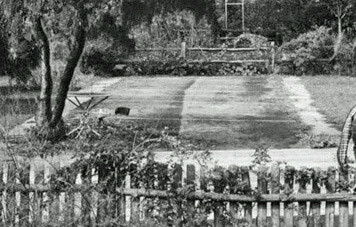 That photo was taken in the backyard of the Stewart’s on Russell Road . The kids are climbing into the yard of the Wroldsen’s. 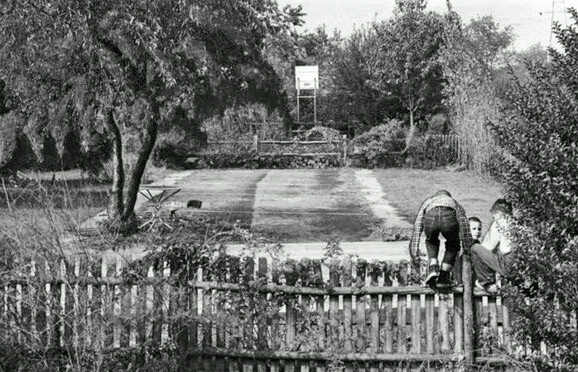 I lived in the yard beyond the second fence and the basketball hoop was nextdoor in the Allio’s yard. Eventually, the hoop made its way to my yard where it also doubled as a hockey goal when it was cold enough to flood for skating. Howard and the rest of us definitely appreciate rememberances of those who lived near the LIMP. Thanks, Bill Harrison. Great post. Love the then and now photos. Great work Frank. I wonder if Arthur jasper logs on to this site? I didn’t ask him when I met him. He is quite the history buff and he is well aware of his backyard and has many other artifacts in his home, which he happily gave us a tour of. Really nice guy. Hard to imagine that LIMP stretch will survive if that house gets sold.